Once in a while the photography gods smile on you, and this was one of those moments. It was a beautiful early-autumn day in 2011 on the western shore of Lake Michigan at Grand Haven. 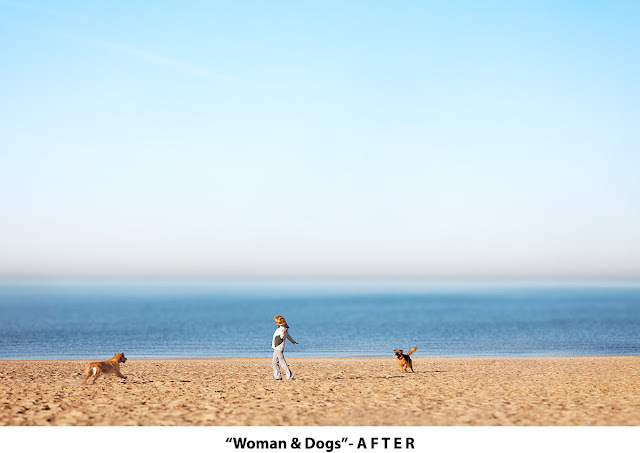 This woman happened to be standing in front of me, arms akimbo, her dogs running toward her from opposite directions through the sand. Perfect. In the moment I didn't choose the best exposure settings so the image is under-exposed. But when you shoot in RAW format, exposure settings can be easily corrected in post-processing, which is what I did. The original image also looks dull, because of under-exposure and because the light at that time of day was flat. I corrected this with fine-contrast and tone curve adjustments that give the image some "pop". I also made separate tone curve adjustments to the woman and dogs, brightening them and bringing out detail, especially in the dogs. In the BEFORE image the depth of field appears infinitely wide. Everything is in focus, from the nearest part of the beach all the way to the horizon. Although this may work well in many circumstances, in this particular case I wanted to isolate my three subjects from foreground and background. So I used a DxO PhotoLab tool that let me create the illusion of narrow depth of field by blurring everything except for the strip containing the woman and dogs. Precise work was required - using both the eraser and cloning tools in Photoshop - to blend the in-focus woman into the blurred background. And then there was the strange round "blob" in the upper right of the BEFORE image (something on my sensor or lens; not sure which). This was easily remedied with the patch tool in Photoshop. 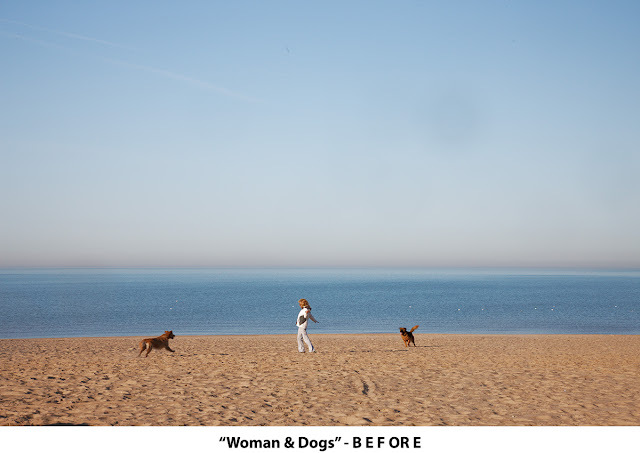 I also cropped the image slightly - the image looked better with more sky and less beach, and with the women and dogs more to the left than in the BEFORE image.